God knows there are plenty of good reasons for ending up in hell, so why challenge fate just because you want to feel like something special? Approximately 10 percent of the world population today is running around and telling others that they are left-handers - this is not a particularly clever move. The Bible contains several examples that God undoubtedly prefer right-handed people. In fact there is much evidence that left-handers will burn in hell for all eternity. Maybe some of you think that it is a coincident if you're left- or right-handed - nothing is more wrong than such an assumption. 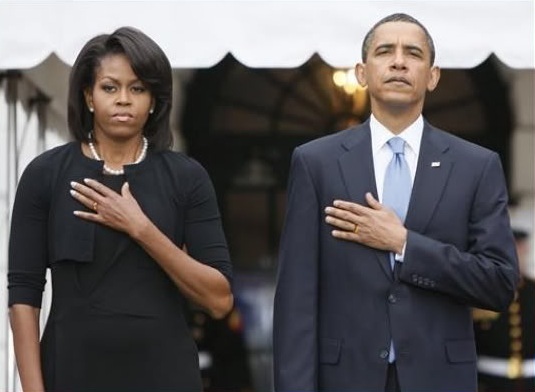 Barack Hussein Obama and his slutty wife Michelle, mocking the Stars & Stribes and GOD by using the devillish left hand instead of the right. Still think it is a coincident?? Take a look on the scripture below, and I'm sure you will never doubt again. 13And Joseph took them both, Ephraim in his right hand toward Israel's left hand, and Manasseh in his left hand toward Israel's right hand, and brought them near to him. 14And Israel stretched out his right hand, and laid it upon Ephraim's head, who was the younger, and his left hand upon Manasseh's head, guiding his hands wittingly; for Manasseh was the firstborn.15And he blessed Joseph, and said, God, before whom my fathers Abraham and Isaac did walk, the God which fed me all my life long unto this day, 16The Angel which redeemed me from all evil, bless the lads; and let my name be named on them, and the name of my fathers Abraham and Isaac; and let them grow into a multitude in the midst of the earth. 17When Joseph saw his father placing his right hand on Ephraim's head he was displeased; so he took hold of his father's hand to move it from Ephraim's head to Manasseh's head.18And Joseph said unto his father, Not so, my father: for this is the firstborn; put thy right hand upon his head. 19And his father refused, and said, I know it, my son, I know it: he also shall become a people, and he also shall be great: but truly his younger brother shall be greater than he, and his seed shall become a multitude of nations. Remember the good old days when teachers would beat the lefthandedness out of a child? With my brother they went as far as tying his left hand to his desk so that he couldn't use it. I am so glad my husband forced me to use my right hand when we met. Amen! I am glad to see somebody giving some much-needed attention to the issue of the disgusting, alternate lifestyle of being left-handed. Of course normal people like us take for granted that our families and friends all use their right hand, but we forget that there is an underbelly to society, a dismal moral abyss of deviants who choose to defy nature and GOD and do everything with their LEFT. Well, I certainly hope this helps them see the light. Wise words dear Mr. Campell - Wise words indeed. I can only amagine how glad your brother must be today, knowing that God made the teachers disciplin in time him for his discusting behavior. Would he have been a True Christian™ today if he was still a "leftie"? - I think not. Your are as blessed as you can be, having a gentle and understanding husband like this. As a husband my self, I know what kind of hard work it is, to disciplin your wife, but True Christian™ husbands are so full of love, that we will always take the time needed for a good beating. You're absolutely right! If only more sinners would stop their awful behavior and accept Jesus, this would indeed be a better place to live. Again and again we try to tell them what will happen to them when they die, but only a few seems to care about God's words. It makes me sad to see how many freaks out there still choose to mock Jesus by using their left-hand to do things, only the right hand were meant to be doing. I heard somewhere that Judas Iscariot was supposed to have been left-handed. [B][COLOR=black]Maybe some of you think that it is a coincident if you're left- or right-handed - nothing is more wrong than such an assumption. What does god think about people who make sweeping statements in his name and don't even bother to use the right word!? COINCIDENT!? The word you're looking for is COINCIDENCE. How can you possibly assume to make such vast generalisations and presumptions about mankind and its invisible but apparently all powerful god, when you haven't even mastered ONE language? Let's suppose there is a god. He created everything, right? Which means he created all the hundreds of languages on our planet, right? Which means he gave you a big enough chance of at least getting ONE of them right, and must be pretty pissed off that you can't even do that, right? If you had taken your time to see where Brother TSB is from, you wouldn't have to worry about everything you just wrote. Why are you really here, Godmocker? It seems clear to me that you are a "left-hander" who just don't want to change. Well I can't say I'm sorry, that you're gonna burn in Hell for that. You are right about one thing though. I’m sincerely sad that I do not master God’s own language “American” to perfection yet. Unfortunately, I am raised in Denmark, where Denmarkian is the first language. As for my opinions... They are, as you can see, based on the Bible’s words, and in clear contrast to you, I believe in each and every one of the scriptures in the Holy Book. In addition… You should probably be careful to criticize my way to write, as long as you choose to write God without a capitalized G. Enjoy Hell. @TheSalvationBeliever I am glad I am right handed! Do you think attacking a True Christian™ over small grammatical errors who has American as a second language is fair? Don't answer, it's not. Listen here, boy. Maybe you should get down off your high horse quickly, because God WILL push you off it otherwise! Well, then I guess I have no reason to become a christian anyways. I'm left handed. Haha you people are so deluded. Seriously it's really sad. That's just one more reason why you should stop your sinister sinning and get right with Christ! Well, since you don't have one, let me explain: Left handers have differently structured brains than right handers. But I'm sure you didn't know that. Any kind of science completely lacks in your cult of brain washing. Just how do you know that for sure? You were told it by a teacher or read it in a science book, on a science website...etc ..? If otherwise, please cite evidence to support WHY you believe that. Do you know how many studies have been done on the brain? Look it up. Were they studies you personally did, thinker? If so please cite the articles you wrote and cite the journal/s? Thanks. Well actually it was jeebus who made me a left hander. What does that have to do with the studies you mentioned as to the brain? You are the one claiming that there is alleged "proof" of certain things and dissing and abusing people you claim don't know about it. WHy not cite the information you claim to be there? If you HAD actually researched it at all, it should well be quick find for you. It WOULD be better however if you had authored the papers yourself of course, because by your 'free-thinking" rhetoric, you can't believe "stuff" others have written, right? Is the difference in structure caused by the demons? Don't worry friend, once Jesus has driven the demons out of your brain it'll be as normal as mine.